A terrific twist on the classic chocolate chip cookie. 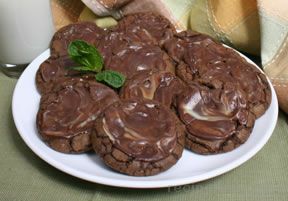 This chocolate cookie is topped with a bit of mint candy that melts and turns into a frosting of sort. In saucepan, melt butter, sugar and water until butter melts. Add chips and stir until almost melted. Remove from heat and stir until completely melted. Cool for 10 minutes. Add eggs and mix at high speed. Mix in remaining ingredients until well blended. Chill mixture for at least 1 hour. Drop onto baking sheet or roll into 1" balls. Bake for 8-10 minutes. 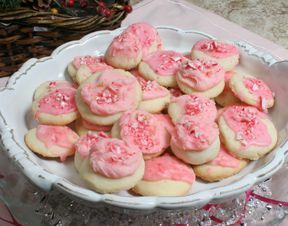 Put a piece of mint candy on each cookie. Break the mints in half if making smaller cookies. Let the mint melt and then swirl with a spoon. 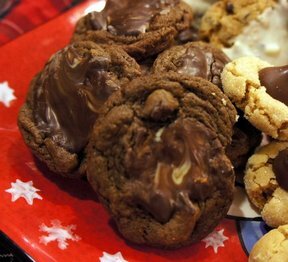 "Terrific holiday cookie! Makes a big batch, too. It's amazing what that little bit of mint adds to the cookie. 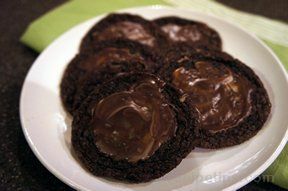 I dropped onto the baking sheet and used a whole mint on each cookie."